Home> Resource> iOS Recovery> How to Recover Deleted Messages on iPhone Xs/Xs Max/XR? This year, Apple released 3 different iPhones to the public: iPhone Xs, iPhone Xs Max and iPhone XR. And the iPhone Xs is said to be the model of phone in the future. However, no matter how powerful functions your iPhone Xs, iPhone Xs Max or iPhone XR have, data losing still happens to them here or there, so when you found some important messages are lost one day. Don't worry, and make yourself calm down, then follow the method on this page to retrieve deleted text messages from iPhone Xs, iPhone Xs Max and iPhone XR easily. Here, you need the help from MobiKin Doctor for iOS (Windows/Mac). This tool is a professional Data Recovery for iPhone, iPad or iPod users, that allows users to recover lost or deleted text messages, contacts, photos, music, calendars, voice memos, etc. 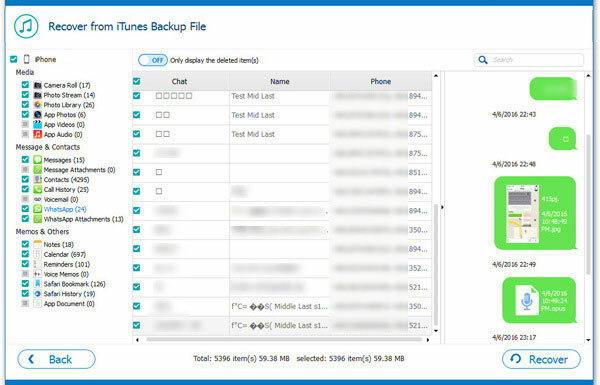 from iPhone itself or iTunes backup as you like. And it can compatible with all kinds of iPhone, iPad or iPod devices on the market, such as the latest iPhone Xs, iPhone Xs Max, iPhone XR, iPhone X, iPhone 8 Plus, iPhone 8, iPad X, iPad Air, the new iPad, iPod touch, and so on. Now, just click the below icon to get this powerful software and see how easy to restore lost text messages on iPhone XS/9/X Plus with this tool. 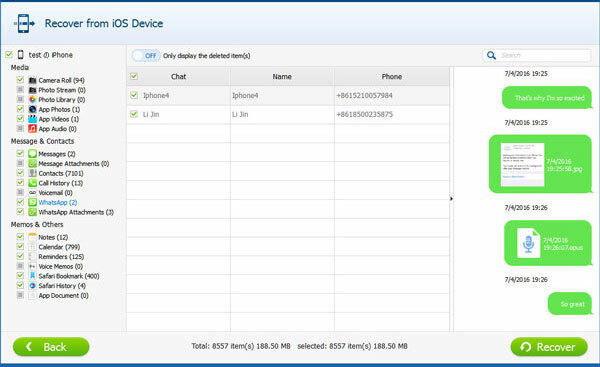 Recover from iOS device: that means this tool will conduct a scanning on your connected device directly, so you can restore any data on it even though data are not backed up with iTunes or iCloud. However, this mode only support iPhone that is jailbroken at present. Recover from iTunes backups: only get back the data that you have synced with iTunes, and it also requires the computer have these iTunes backup files. Now, just choose one of the recovery mode and follow the different steps to start your own SMS recovery process. Step 1. 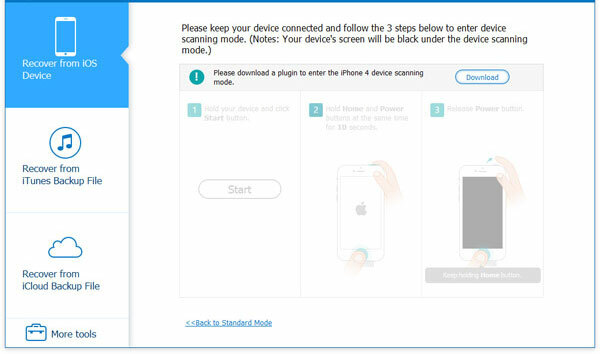 Let's suppose that your iPhone is jailbroken, then you can click "Start Scan" button on the screen, then the program will conduct a deeply scanning on your linked iPhone 9, iPhone XS or iPhone X Plus. Step 2. Now, you can directly enter the category of "Messages" by clicking it on the left panel, then preview and locate your lost messages in the right panel. Step 3. Tick the messages you wish to restore one by one, then click "Recover" button to save them on your computer. Step 2. Select the iTunes backup file of your iPhone XS/X Plus/9, then click "Start Scan" button to begin the scanning process. Step 3. When the scanning is finished, you can go to "Messages" and find out all your lost messages, tick them and hit "Recover" button to save them on PC. How to Speed Up iPhone XS, XS Max, XR, X, 8/8 Plus? How Can I Recover Data oniPhone Xs/Xs Max/XR? Finding Ways to Transfer Contacts to iPhone Xs/Xs Max/XR? Here! How to Transfer Data to iPhone Xs/Xs Max/XR/8/7? How to Transfer Photos to iPhone Xs/Xs Max/XR/8 Plus/8? How to Restore Backups to iPhone Xs/Xs Max/XR/X/8/8 Plus?